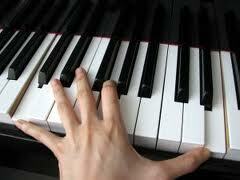 The stereotypes are: A great pianist has God-given perfect pitch and long-tapered fingers. End of story. Now if you log onto You Tube and sample lots of remarkable piano playing, you’ll quickly discover that short and stubby fingers can work musical magic. Given her bio-genetics and 4’9″ inch height, you can watch her rip through a fiery composition! Talk about finger stretches that KILL! My Gold Standard Adult Pupils! I'm the proud mentor of seven COMMITTED adult piano students, three of whom were TAGGED with body stickers for doing GOOD time at their lessons yesterday. NOTE: None have been coerced by authorities to sign up. (i.e. Parents) Each is a VOLUNTARY admission. (LIVE or in Cyber) Ravi, a thirty-plus chess champion/financial analyst, is one… Continue reading My Gold Standard Adult Pupils!